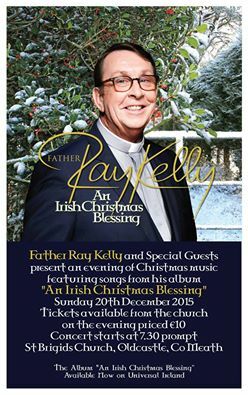 Fr Ray Kelly will be singing at a Special Concert on 20th December 2015 at St Brigid’s Church in Oldcastle, Meath, some Special Guests will be joining Fr Ray Kelly for this pre-Christmas Special Concert. The Christmas Special will be filmed to share worldwide so that Fr Ray’s many millions of Fans can enjoy this wonderful event. Only €10 per-person to enjoy this concert live, simply pay at the door of St Brigid’s Church when you arrive. Fr Ray Kelly is a modest man who knows that juggling a flourishing music career along with priestly duties is not easy but that is a normal day in the life of singing sensation Father Ray Kelly. The Tyrrellspass, Co. Westmeath, native spends the majority of his time working in his parish in Oldcastle, County Meath. When Fr Ray Kelly is not at the altar, the young 62-year-old Fr Ray is on stage across the world performing to his millions of fans and he has just released his Special Christmas album. In April 2014, Fr Ray Kelly became an internet phenomenon when his version of Leonard Cohen’s Hallelujah was uploaded to YouTube. Performing the song in his parish church in Oldcastle Meath while officiating a wedding, his incredible voice was capture on camera and shared world-wide. More than a year on from his initial fame, Fr Ray Kelly is going from strength to strength while remaining at the core of his community. “I think it’s on something like 46 million views now,” he laughs. After being recorded by a member of the congregation on the day of the wedding, Fr Ray became an almost overnight star when his video went viral and 46 million views later, his life has been completely changed.